When it comes to your diet, the most current advice is perhaps the kind that begins with 'eat less' or 'restrict fat'. I've never been convinced and I'm not alone. Most of us may feel overwhelmed with conflicting nutrition and diet opinions but I've learnt that deprivation is not the solution, creating a balance is. It is essential to get the right type and amount of foods to support a healthy lifestyle. What is a balanced diet? A diet that focuses on providing all the nutrients that your body needs. It comprises of macronutrients like protein, carbohydrates and fat along with micronutrients which include vitamins and minerals. Each of them has a different role to play in maintaining various body functions. These nutrients are derived through a combination of the five major food groups - fruits and vegetables, cereals and pulses, meat and dairy products and fats and oils. 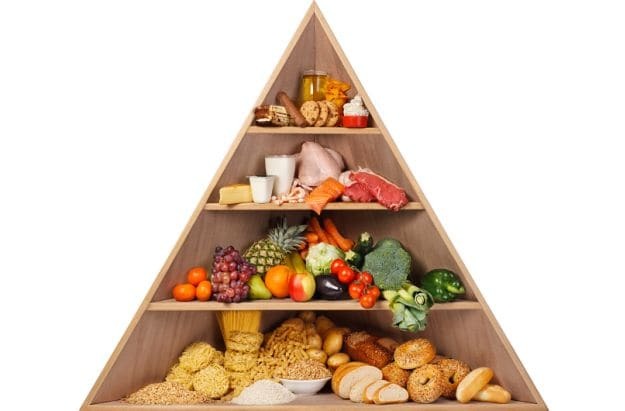 The rules for a balanced diet seem simple but that's not the whole story - how much do you need daily, when is the best time to eat proteins or carbs and what should the portion size be? Carbohydrates: The truth about carbs may be hard to digest but nutritionists say they're an important part of a healthy balanced diet. Carbohydrates are your body's main source of energy. 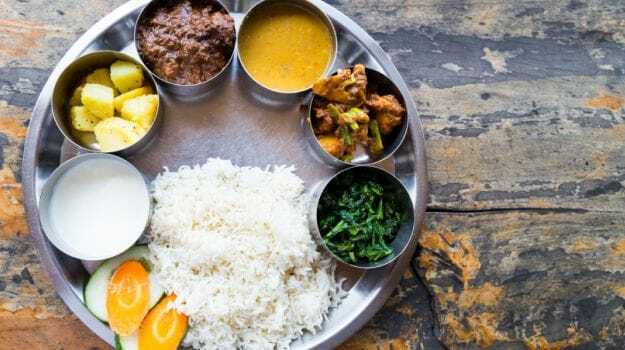 In India, 70-80% of total dietary calories are derived from carbohydrates present in plant foods such as cereals, millets and pulses. "Half of your total calories of the day should come from carbs. The problem is that we emphasize more on refined carbs in the form of breads, biscuits, white rice and wheat flour. We forget that carbs come from other healthier sources like whole grains which include brown rice, millets and oats that have a higher nutritive value. These are also great sources of fiber," explains Dr. Mukta Vasishta, Chief Dietician at Gangaram Hospital in New Delhi. Your meal would be incomplete without fiber - both soluble and insoluble. It helps with digestion but few people are getting enough. Eat, don't drink your fruits and vegetables. Most fruits and vegetables (besides potatoes and corn) and whole grains are also foods with a low glycemic index which means that they don't cause sudden spikes in blood sugar levels and help maintain them. The National Institute of Nutrition (NIN) suggests 30 grams of cereals and millets along with 100 grams of starchy vegetables. and lactose in milk, while the complex polysaccharides are starches in cereals, millets, pulses and root vegetables and glycogen in animal foods. Proteins: Wellness and Nutrition expert, Dr Shikha Sharma tells me, "About 30 to 35% of your diet should consist of protein. 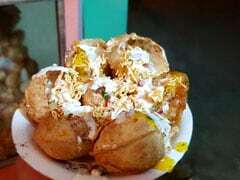 This could be in the form of pulses, milk, leafy greens, eggs, white meat or sprouts." I'd agree since protein is the main component of all of your body's cells, as well as your hair, skin and soft tissues. Moreover, we burn more calories in digesting proteins than carbs. Since men tend to be muscular and usually weigh more than women, they require more protein. Dr. Rupali Dutta, Chief Clinical Nutritionist at Fortis-Escorts Hospital highlights the issue of protein deficiency in our country and recommends that we should have one helping of protein with every meal, be it in any form like whole dals, cottage cheese or gram flour or 30 grams of pulses as per NIN. A recent survey conducted by the Indian Market Research Bureau revealed that 9 out of 10 people of the sample consumed inadequate amount of protein. This could be due to the increasing consumption of convenience foods that are high in carbs and sugars and low in protein. Fats: Fats provide energy, store vitamins and synthesize hormones. According to NIN, about 1/5th of your diet or 20% should be devoted to fats all three kinds -polyunsaturated, monosaturated and omega-3 fatty acids. Vegetable oil used in day to day cooking is a major source of visible fat in our diet. To ensure optimal fat quality the use of a combination of vegetable oils is important. The thumb rule - don't fear trying different oils. It is suggested to have a good blend of various types of oils for a balanced diet. You could juggle between butter, ghee, olive oil, mustard oil, soyabean, sesame or even groundnut oil for different meals, suggests Dr. Shikha Sharma. Depend more on unrefined (Kachi Ghani) or cold pressed oils versus refined oils, goes without saying but that always seems to be a struggle. Vitamins and Minerals: These micronutrients support metabolism, nerve and muscle function, bone maintenance and cell production. 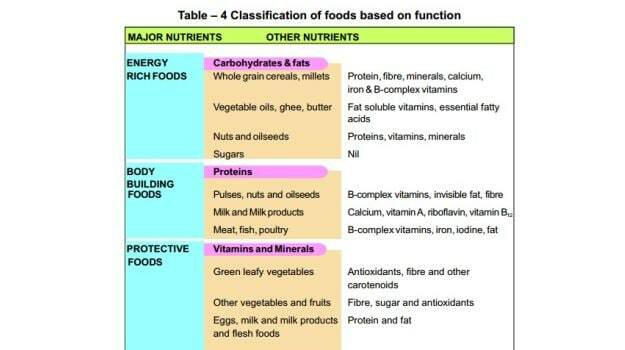 Minerals are inorganic and so minerals from plants, meat and fish easily find their way into body. Vitamins are fragile compounds and it's difficult to shuttle them as they may be destroyed during cooking or storing. They can be derived from nuts, oilseeds, fruits and green leafy vegetables. Vitamin A, E, B12and D are vital and so is calcium and iron. The National Institute of Nutrition recommends the consumption of 100 grams of greens and 100 grams of fruits each day. In India, iron deficiency or anaemia affects about 50% of the population, more women than men. "Since women go through several hormonal changes from pregnancy to menstrual and menopause, they need to maintain a steady dose of calcium, Vitamin D, folic acid, iron and biotin," says Dr. Shikha Sharma. Another crucial aspect that Dr. Shikha throws the spotlight on is the need to drink adequate water. Lack of it can lead to acidity and water retention. Anywhere between six to eight glasses of water is needed to keep your body hydrated. To keep your body running smoothly, you require three main meals coupled with healthy snacking to curb cravings. Ideally, breakfast should be the heaviest meal of the day but with our busy schedules all we manage to do is chug a glass of milk and grab a toast. When your day starts on a light note followed by a hurried lunch, you end up eating much more for dinner than needed. While dinner should be the lightest, in a common Indian household, it is an elaborate family meal. Time to change. The components of the balanced diet remain the same, the difference lies in how they're served at every meal. Dr. Gargi Sharma guides us to create an ideal routine. Breakfast: A good morning meal should comprise of three things. These are dietary fiber or carbohydrates (whole-grain bread, oatmeal, white oats, wheat flakes), proteins (eggs and egg whites, yoghurt, milk and sprouts) and nuts (almonds, walnuts, apricots and figs). This way you'll eat fewer calories the rest of the day. Lunch: Make it a mix of high-fibre whole grains like brown rice, barley or jowar, starchy carbs and some good source of proteins like cottage cheese, pulses, chicken or fish. Include some probiotics like yoghurt or buttermilk and fibre from fresh salads to complete your meal. Dinner: To maintain a healthy balanced diet, pick foods with a high satiety value that keep you full for longer and curb midnight bingeing. Fill your plate with greens to load up on vitamins and minerals. Limit carbs but don't cut them off. Combine them with some healthy fats like fish, nuts and seed oils. Your body can use these for regeneration and repair overnight. Don't give up on snacking. It supplies the quick 'pick-me-up' you need. Trade the junk for fresh fruits, crudités with hung curd dip, nuts or a salad. Eating small yet frequent meals is the ideal way. This doesn't mean you eat more but spread your daily requirements throughout the day. When you eat is as important as what you eat. The key to smooth digestion lies in the timing of the meals. 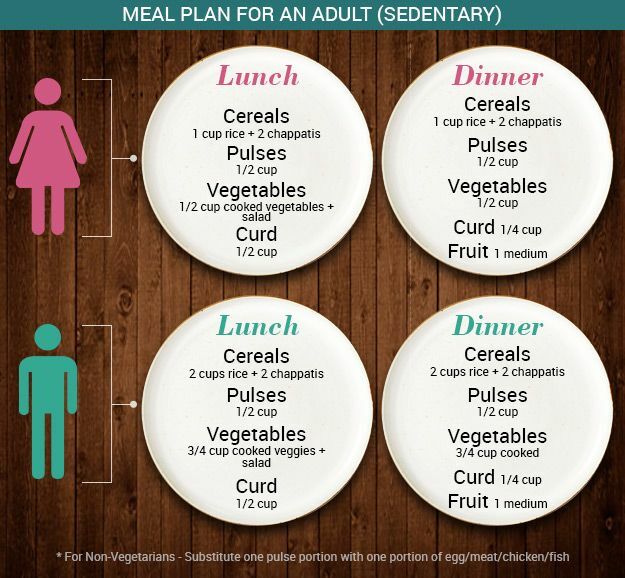 Dr. Shikha Sharma pinpoints the optimum time to eat breakfast, lunch and dinner. "The first meal of the day should be taken about one and a half hours after waking up. Further, there should at least be a three-hour gap between breakfast and lunch and the same between lunch and teatime. Dinner is best enjoyed two hours before your sleep time to allow the body to wrap up the digestion process," she recommends.